Crisp-tipped, juicy, and tender, these spears are great with lamb or fish. 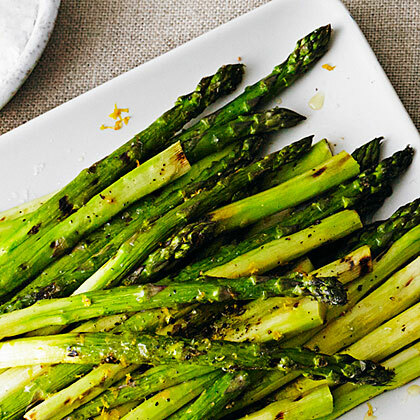 Opt for fat asparagus--the spears will be tender but not mushy when the tips are crisp. Lemon zest, versus juice, gives a lot of flavor without too much acidity or moisture. Heat a grill to medium-high (about 400°). Shave thick, fibrous asparagus stalks with a vegetable peeler, laying stalks flat against a work surface to keep them from breaking under the pressure. Break off woody lower stems. Toss stalks gently with 1 1/2 tbsp. oil, 3/4 tsp. salt, and 1/2 tsp. pepper. Lay asparagus on cooking grate and grill, covered, in 2 batches if necessary; turn often until lightly browned all over and tips are crisp, 5 to 10 minutes. Serve warm or at room temperature, seasoned to taste with lemon zest, juice, and a little more oil, salt, and pepper.